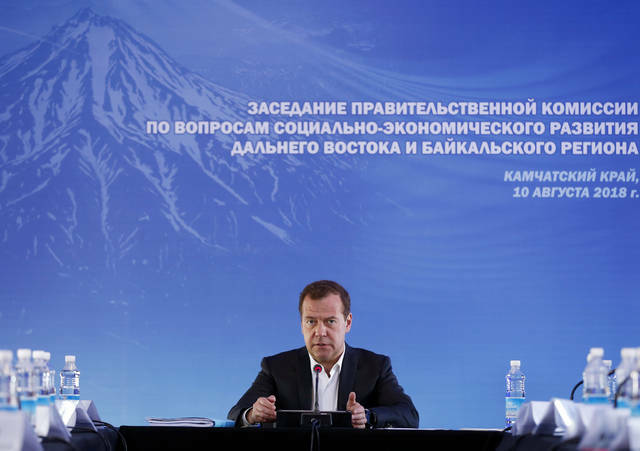 Russian Prime Minister Dmitry Medvedev speaks during a meeting in Kamchatka Peninsula region, Russian Far East, Russia, Friday. Russia’s prime minister sternly warned the United States on Friday against ramping up sanctions, saying that Moscow will retaliate with economic, political and unspecified “other” means. If sanctions are expanded even further to target Russia’s top state-controlled banks, freezing their dollar transactions — as proposed under legislation introduced in the Senate this month — it would amount to a “declaration of economic war,” Russian Prime Minister Dmitry Medvedev said Friday.